Contouring and highlighting has become a popular technique thanks to celebrities such as the Kardashians. Its’ purpose is to help sculpt and define and your facial features, whilst maintaining a natural look. I’ve tried 4 different products all picture above. 1. Sleek Face Form – This is a powder contouring and highlighting kit which comes with either a blusher or a bronzer and comes in fair, medium or dark. I must admit for £6 this was pretty impressive, the powders were a lot more pigmented than I expected. However, it is sometimes hard not to make a mess due to the powder being loose so I think I prefer using the stick. 2. Artist of Make up Zukreat Cosmetics Contour Stick – This is a creamy stick which again comes in 3 shades. I really like using this because it is easier to build up and blend in comparison to using a powder. I paid £20 for this and it was worth it, however, there are cheaper alternatives which do the same trick. For example using a foundation (liquid or a stick) in a darker shade will have the same effect. 3. 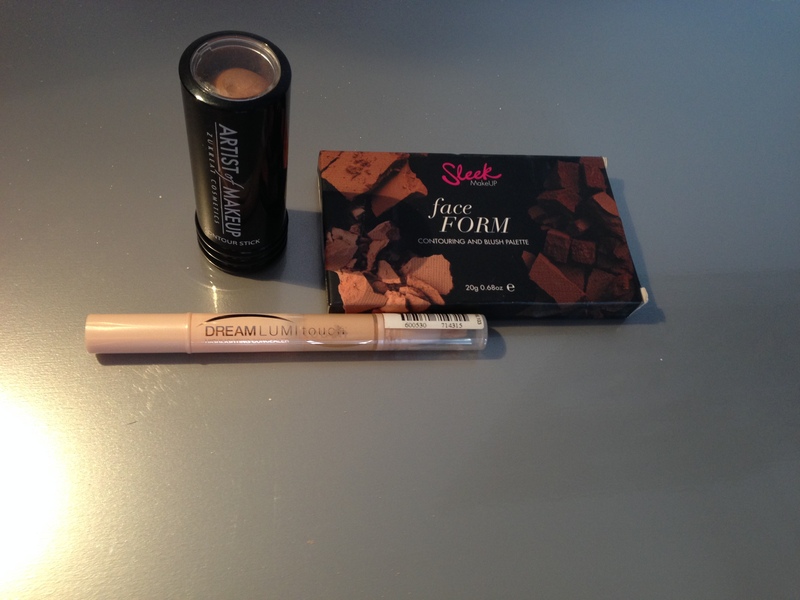 Maybelline Dream Lumi Concealer (£6.99) – This is the best concealer/highlighter I’ve used. The product itself is so easy to use and it doesn’t leave you look too shiny. 4. No7 Skin Illuminator (£11) – This comes in pink (for fair skin) or peach (for darker skin). I had read reviews on this and I have to say I wasn’t that impressed by this. For starters, the brush was so difficult to use and you get a lot of wastage from it, although it is easy to yank out. It looks better underneath the foundation which is difficult because I usually like to do my contouring and highlighting over my foundation. It isn’t that bendable and leaves a glittery as opposed to a radiant finish. BLEND BLEND BLEND. With anything you use, make sure you blend it completely into your skin. The idea is to have a natural finish and for it not to look streaky. Use a matte powder to set the contour and highlighter for a nice overall finish. This chart created by GiveGoodFace shows exactly where you should contour and highlight. What products do you use to contour and highlight? thank you! i’ve heard lots of good things about the revlon illuminator, i’m definitely going to give it a try!